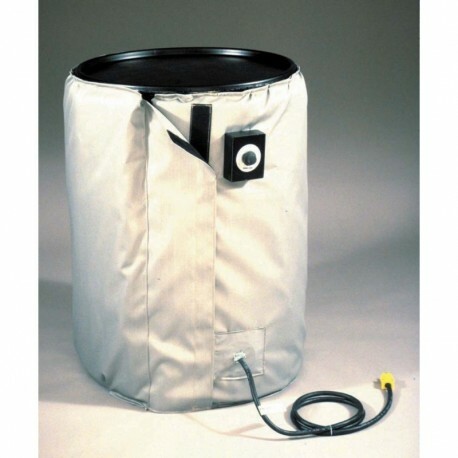 The 55 GALLON DRUM HEATER FOR POLY - FIBERGLASS OR STEEL DRUMS is an efficient method of temperature elevation, freeze protection and viscosity control of non-hazardous materials. Knitted heating elements are located in the lower third of the blanket to avoid overheating of partially filled drums. Wraparound blanket is filled with high density fiberglass and has a Velcro® closure for quick installation. Silicone-impregnated surface resists chemicals and moisture. Drum Heater has built-in thermostat. Equipped with 6 ft cord. Available for steel or poly/fiberglass drums. Blanket is 33-3/4” tall, fits 22-1/2” diameter 55 gallon drums. Weighs 22 lbs.